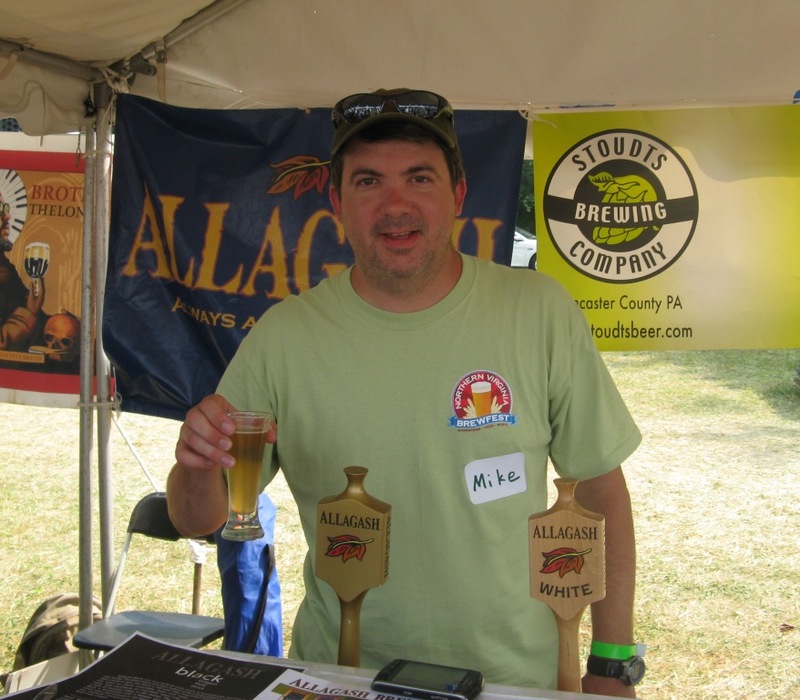 I spent Saturday, June 26 volunteering at the Northern Virginia Summer Brewfest in Leesburg, Virginia. Here’s a quick recap of the fest and my beer sampling list. The brewfest was open from 11:00 a.m. to 9:00 p.m., and I was assigned to pour beer on the second shift from 3:00 p.m. to 8:00 p.m. More than 50 breweries sent beer for the festival, but they can’t all send reps to serve their beer to the masses that attend. That’s where the volunteers come in – we serve the beers on behalf of the breweries and the distributors. For a craft beer enthusiast, the brewfest volunteer experience is unrivaled; it’s an entire day of talking about and sampling great beer! I’ve worked about a dozen brewfests and each one has been an awesome experience. After checking in my hotel and taking a cab to the fest, I had time to sample a few beers before my shift began. A little before 3:00, I checked in at the volunteer tent, where our beer captain told us to select the tent we wanted to man. I picked Allagash, which was offering their White and Black. Like a good beer pourer, I took some time to get to know the beers I was serving before I started working. Of course I already knew about the White, the best-brewed Belgian Wit in the U.S. But I wasn’t too familiar with the Black, a Belgian-style Stout. I’m familiar with it now, and it is highly recommended, just like all of the Allagash beers! At the request of one of the fest patrons, I also served a Black and White – a Belgian version of the Black and Tan. The Black layered nicely atop the White for a beautiful presentation and interesting flavor. Word got around, and I served several more Black and White blends for people who requested it. I’m not sure if Allagash founder and head brewer Rob Tod would appreciate me blending and serving his beers this way, but I certainly didn’t force it on anyone. Allagash was a popular spot and we were pouring non-stop, but I also found time to sample many beers. My fellow volunteers and I took turns pouring beer while the others meandered and sampled. The day’s end came too quickly – it always does at a brewfest. All told, I sampled 25 beers from 19 breweries. Below I’ve noted my favorites followed by the complete list of beers sampled. Berliner Weisse beers – Several of the brewers offered this sour German-style beer, which was a perfect thirst-quencher on a 90-degree summer day. Tip of the hat to Dogfish Head, Bell’s, and Vintage 50. Stone Sublimely Self-Righteous Ale – One of my favorites of the day. An incredibly complex and delicious beer that’s not to be taken lightly at 8.7% ABV and 90 IBUs. You have to taste it to believe it. Sort of like the Black and White. Yeti Imperial Stout from Great Divide Brewing Company – This strong stout (9.5%) was just steps away from the Allagash taps, so I had my fill. Yeti is a beer to be savored, but that didn’t stop a few beer drinkers from chugging tasting glasses of Yeti towards the end of the night, in order to use up their beer tickets before the taps were cut off. I’d also give a nod to the beers from Stoudts, 21st Amendment Brewery, and Founders Brewing Company.